After their heavy defeat to Man City on Sunday, question marks have been raised over Maurizio Sarri’s future at Chelsea. The 6-0 loss at the Etihad leaves Chelsea in sixth place in the Premier League table, as they’ve fallen a point adrift of a resurgent Man Utd, while Arsenal leapfrogged them at the weekend too. Given qualification for the Champions League would undoubtedly have been the minimum expectation for Sarri, it remains to be seen if he can get his side back on track and getting positive results as well as playing his preferred style of football. 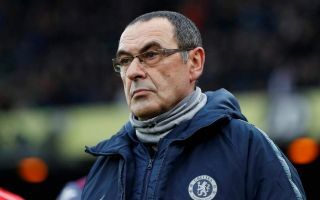 As noted by the Telegraph, there are doubts over the Italian tactician’s future at Stamford Bridge, but it remains to be seen whether or not the Blues hierarchy opt to make a change during the season or give him time to turn things around ahead of the summer. Should it be the former option, Sportmediaset claim that assistant coach and Chelsea legend Gianfranco Zola could step in on an interim basis and take charge until the end of the season. The 52-year-old hasn’t had the most glittering of coaching careers thus far, as he failed to entirely convince in spells with the likes of West Ham, Watford, Cagliari and Birmingham City. Nevertheless, he knows the club inside and out having represented the Blues as a player and coach, while he will understand the culture and demands from the supporters. Similarly to Ole Gunnar Solskjaer’s impact at Man Utd since December, it could prove to be a sensible short-term fix, but ultimately it’s surely too early to scrap the work done by Sarri given the former Napoli boss has essentially tried to transform the way Chelsea play in comparison to his predecessors. With his preference for dominating possession and attacking football, Sarri has a completely different mindset compared to the likes of Jose Mourinho and Antonio Conte. However, unless he obtains results and quickly, talk of his future at Chelsea being in doubt could intensify.